Our luxury hotel, located beside the Al Jawhara Hotel apartments is a superb addition to our successful chain of sophisticated accommodations. 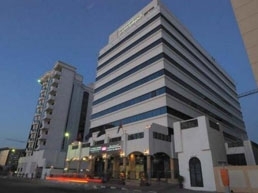 Al Jawhara Gardens Hotel respects traditional style while embracing modern comfort. We offer traditional Emirates hospitality, a family atmosphere and professional services. Our spacious and homely rooms and suites are ideal for both leisure and business travelers from all nationalities across the globe.